This is the third and final post about how I cooked my way through the hurricane. While it’s been good for my blogging productivity, let’s hope there are no more natural disaster-induced motivators, hmm? Anyway, having survived Irene basically unscathed, I found myself with far more time than I expected the day after. So I baked, but just because I had the time doesn’t mean I had the inclination to pull out all the baking stops and do something stupidly “Thank God, we’re alive!” manic like eclairs (though I did make eclairs during the blogging hiatus, because there is, in fact, a correct time and place for stupidly manic cooking). I just wanted something comforting, low on the effort scale, and, since I didn’t know if commuter rail was going to be back up in time for me to go to work on Monday morning, capable of keeping an extra day if necessary. What fit that particular bill excellently was gingerbread. As we all know, my quest for ever more obnoxiously in-your-face gingery things is a lifelong one, and in that quest, I had tried the Classic Gingerbread Cake recipe in this January’s issue of Cook’s Illustrated. 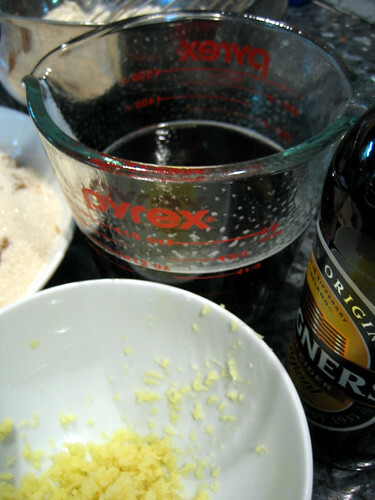 Apart from the bordering-on-foolhardy quantities of both fresh and powdered ginger, the recipe had two other things going for it: the clever use of stout to deepen the flavor, and the promise of eliminating the sunken and damp middle gingerbread is so often prone to. 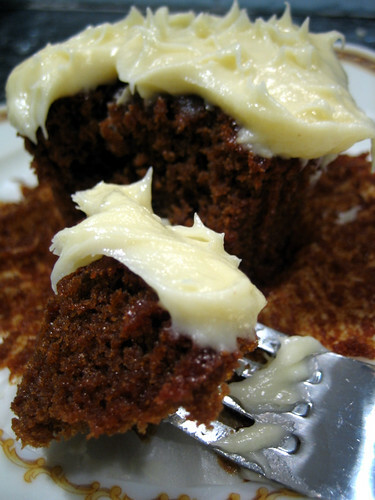 The recipe delivered on both intense gingery flavor and structural soundness, and was particularly well-received by the coworkers, who as we’ve established are surprisingly amenable to having their palates challenged via their weekly baked goods. The one snag was that I had no stout on hand, and because I live in a state with patently absurd liquor laws and was not going to make a special trip to the beer distributor on the day after a hurricane to buy stout by the full case, I had to substitute what I did have: a nice hard cider. To make up the required volume and add some more depth, I spiked it with some really spectacular rum we picked up on our now-annual summer jaunt to the Berkshires with His Lordship’s community orchestra. Despite the fact that the CI people said it wasn’t worth making the recipe with anything but stout, I noticed no dumbing down of the cake once baked. The cider, rum and very dark blackstrap molasses I had in the pantry contributed more than enough low notes to support the double-ginger assault. Honestly, I think it’s just as good with the substitution, and since we have not much use for stout while I adore hard cider, I’ll be going with this combination from now on. For ease of distribution, as usual with Monday treats, I converted the recipe to cupcakes, which I spread with a cream cheese and lemon curd frosting. The frosting is seriously optional, and if it were up to His Lordship there would be no question about leaving it off, since he didn’t care for the additional sourness. For those of you who are similarly less obsessed about citrus than I am, feel free to eat them plain or with a dab of salted butter for just the merest bit of decadence. Whisk together flour, ginger, baking powder, salt, cinnamon and black pepper in a large bowl and set aside. Bring the cider and rum to a boil in a small pan over medium heat. In the meantime, set the oven rack to the middle position, preheat the oven to 350 F and line 2 ½ muffin trays with cupcake liners. Pour the hot cider and rum into a medium bowl and stir in the baking soda, which will foam up aggressively, then stir in the molasses, honey, and sugars. Once the sugar has dissolved and the mixture is a bit cooler, whisk in the eggs, oil and grated ginger. Add the wet mixture into the dry ingredients a third at a time, whisking vigorously between additions until completely smooth before adding the next third. (For once, you need not be afraid of over-mixing.) The batter will be quite liquid after the final addition, so use a ladle to divide it evenly among the lined muffin cups. Tap the filled muffin trays gently against the counter a couple of times to release any air bubbles, and bake 25-30 minutes, until the tops are firm to the touch and a tester comes out mostly clean. Cool briefly in their tins before lifting out by the liners onto a wire rack and cooling completely. While the cupcakes are cooling, beat the cream cheese, butter, powdered sugar and salt together in a mixer fitted with the paddle attachment until light. Beat in the lemon curd and taste, adding more if you want a more pronounced lemon flavor. Spread the frosting thinly over the cooled cupcakes. 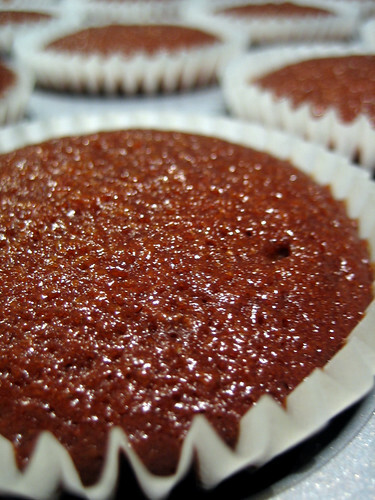 Unfrosted cupcakes will keep for several days at room temperature in an airtight container. Once frosted, they really should be refrigerated, though you should bring them back to room temperature before serving since the chill will blunt some of the spicy kick. I could have stretched the batter among three full muffin tins, yielding 36 cupcakes, but they would have been slightly smaller than I wanted. If you prefer that many, start checking them at 20 minutes for doneness. If you want to make a large sheet cake instead, pour the batter into a 9×13 pan, greased and floured, and bake 35-45 minutes. Cool completely in the pan before frosting and slicing. The quantity of frosting here is just enough to thinly cover the full batch of cupcakes. If you want to be much more generous or to pipe designs with it, double the quantities. Very well then, I repeat myself. 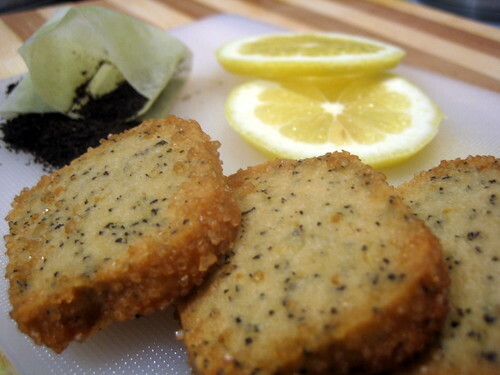 I just love the combination of rosemary and lemon so much that I never get sick of it. 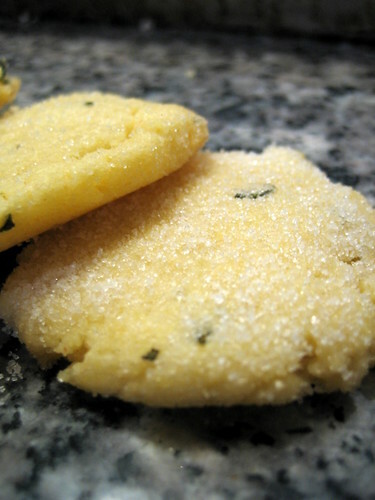 I’ve done it in shortbread, which is sublime; I’ve done it in flavored salt, which is handy; and now I’ve done it in these semolina cookies, which are humble and unassuming. They’re all different and they’re all good, so I don’t see a particular need to make apologies for a little bit of a recurring theme. 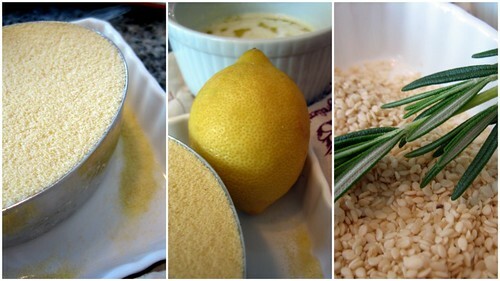 I bought the semolina some weeks back with the intention of using it in bread, since I’ve been doing more bread baking. Late last week, though, I had an urge to come up with a sweet application for semolina, and I specifically wanted a not-too-sweet, toothy cookie to make a change from the very sweet and decadent cookies I took to the office the past two Mondays. Surprisingly enough, there’s a dearth of semolina-based cookies in my ridiculous cookbook collection, and nothing I found online quite fit the bill, so I decided to adapt a recipe for a polenta-based cookie from Babbo instead. Unlike my shortbread recipe, which has neon-bright lemon and rosemary flavor, these have just a charming hint, embedded in a tender cookie with just a bit of gritty edge. They’re perfect with an afternoon cup of tea, or if you want to be really Italian about it, with a glass of wine. Combine the flour, semolina, sugar, baking powder and salt in the bowl of a mixer fitted with the paddle attachment. Run the mixer briefly to stir the dry ingredients together. Sir the egg and yolk, lemon zest and rosemary into the butter. Pour the mixture over the dry ingredients and run the mixer until a crumbly dough forms. Spoon the dough into a zip-top bag and chill for at least an hour. Preheat the oven to 325F and line multiple baking sheets with parchment paper. Pour a good amount of sugar into a shallow dish. Scoop out tablespoons of the dough and roll into balls the size of unshelled hazelnuts. (You may have to squish and pinch a bit to get the dough to hold together.) 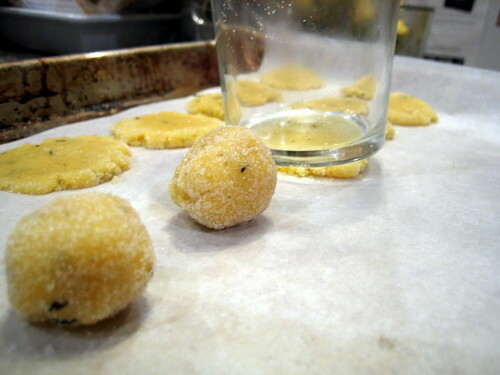 Roll the balls of dough in the sugar until well-coated, place on the lined sheets, and use the bottom of a glass to press into cookies 1/4 inch thick. Sprinkle the tops with additional sugar. Bake the cookies until firm and turning golden around the edges, approximately 12-15 minutes. Cool on the sheets briefly, then move to a rack to finish cooling. Store in airtight containers to maintain crispness. You could leave out either the lemon or the rosemary or both if they’re not to your liking. 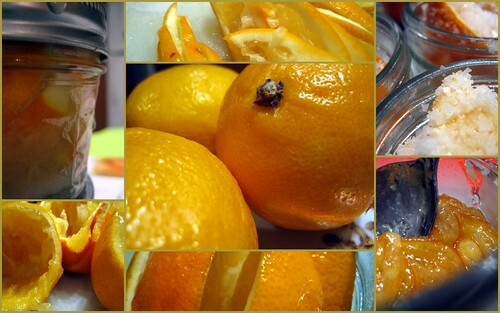 Lime or orange zest, or a combination of the two, would be quite nice. Crushed anise seeds would also be good. If you don’t have semolina on hand, you could substitute quick-cooking polenta, as in the original recipe, or finely ground cornmeal. Flan may be the default dessert throughout Latin America, but I didn’t actually grow up eating it because my mother did not make it. Don’t get me wrong; Mom is a champion baker and made plenty of other desserts, including some ridiculously complicated ones I had the temerity to demand for certain birthdays. As she explained over Christmas dinner preparation this year, though, flan was her mother’s territory and therefore ground she feared to tread. Since Grandma only visited once a year and never once made flan that I can recall, I didn’t have much interaction with flan until my teens, when we moved to Mexico. As it could be had in any restaurant there, I enthusiastically embraced its wobbly, burnt-caramel ubiquity as both a comfort food and a special indulgence. Ever since then, even if I suspect from the quality of the rest of the meal that it won’t be particularly good, I’ve had a hard time passing flan up when I see it on a restaurant’s menu. Although some might consider them basically the same thing, I don’t feel the same way about creme brulee. I’ve always found creme brulee to be too rich, too pasty, too bland and boring under that crackly sugar. I regularly find that all that butterfat just throws the ratios out of whack and drowns out the vanilla bean or lavender or yuzu or whatever flavoring-du-jour the pastry chef tried to infuse into it. Flan, on the other hand, is the perfect balance of eggy and creamy. Even a meh flan is enjoyable. This flan, the home version of the best flan I’ve ever had, is not remotely meh. I ate it twice while completing an internship in Washington DC over the summer; the first time at Jose Andres’s flagship restaurant, Jaleo, and the second time at the cafe of the National Gallery of Art, which he took over in conjunction with two exhibits of Spanish art. The Jaleo version was dolled up with foams and garnishes while the Cafe España one was served perfectly plain, but both times the custard was smooth, creamy, golden perfection accented by a smoky-topaz caramel so dark it was seriously flirting with danger. It was the complete opposite of all those profoundly disappointing brulees, and what every half-assed Mexican restaurant flan aspires to be. In passionate love, I demanded that the waiter find me one of the last remaining printed recipe brochures (available here if you also want a fabulous gazpacho recipe and a chicken empanada I obviously can’t vouch for, but which is probably great). I then bided my time until the next big family gathering, and insisted on making this in addition to our non-negotiable Christmas dessert, a chocolate buche de noel we’ve had as long as we’ve been north of the equator. While I can’t claim to have executed it as flawlessly as Jose, I daresay I did Mama Andres, whose recipe it is, credit. I also think Grandma would have approved. If you’re at all a flanatic like me, you absolutely must try this. Apart from the bit involving molten sugar, which is always a little intimidating given the high burn potential, it’s a fabulously easy recipe. If the burnt sugar bit really freaks you out, you can and must make this anyway. It won’t be exactly the same, but you could just spoon some dulce de leche or store-bought caramel sauce in the bottom of the ramekins before pouring the custard over. You could also try jam, as Alton Brown suggests. Cook the cup of sugar for the caramel in a small saucepan over medium-low heat until it melts and begins to brown. Continue cooking until the sugar becomes dark brown, stirring constantly to avoid burning. Remove the pan from heat and carefully add the warm water, standing well back to avoid the sputtering. Return pan to the heat and continue cooking about 5 minutes, until dark and thick, like grade-B maple syrup. Line the bottom of a high-sided 9×13 baking pan with a clean kitchen towel and set the coated ramekins in the pan. In a large bowl, whisk together the eggs and yolks. Pour a bit of the hot cream gently into the eggs to temper them, whisking vigorously, then whisk in the rest of the cream. Strain the mixture into a large liquid measuring cup, stirring in the vanilla extract. Fill the caramel-lined ramekins with the custard. Set the pan with the filled ramekins onto the middle rack of the oven. Carefully fill the pan with enough hot water to reach halfway up the sides of the ramekins, making sure not to drip any water into the custards. Bake for 50-60 minutes, until the flans look set but the middles are still a bit jiggly. 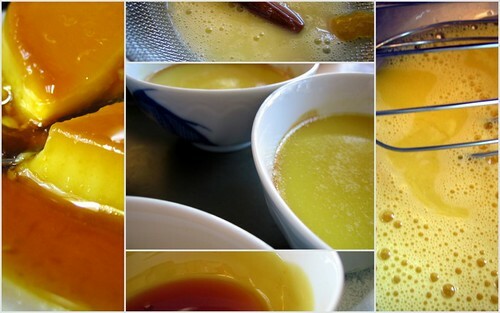 Remove from the oven and lift the flans out of the water bath to cool to room temperature. Wrap with plastic wrap and refrigerate until completely cold. To serve, run a knife along the edges of the flans to loosen them. Place a dessert plate upside-down over the top of a ramekin, and invert. Shake gently but firmly until the flan drops onto the plate, and lift the ramekin up to let the caramel drizzle down onto the custard. Repeat with the remaining flans. The recipe as originally written was for six servings, but you should use quite small ramekins or custard cups if you want any height in your flan at that quantity. Dividing the custard six ways among regular-sized ramekins will result in rather flat, but still lovely, flans. If you want taller, more substantial ones, make just four flans. 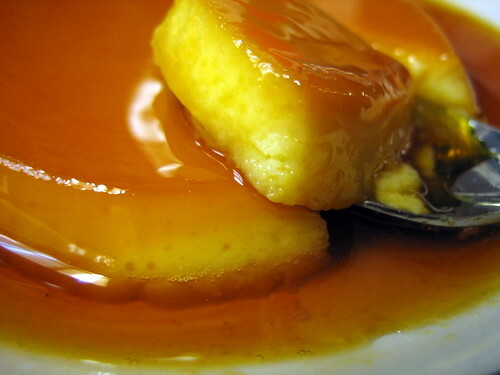 You could also make a single, bigger flan, but in my experience, it is much harder to tell when a bigger one is done, and it’s also harder to unmold without cracking the flan or spilling caramel sauce on your work surface or yourself. His Lordship’s brother, who graciously hosted us as he does every Christmas, does not have ramekins, so I made these in small oven-safe soup bowls. It worked well, as you can see. You can make a coconut variation by substituting coconut milk for some or all of the dairy and leaving out the cinnamon and lemon. I did this on Wednesday to use up the two leftover yolks from my birthday souffle, because that’s just the kind of crazy I am. It’s not just His Lordship who doesn’t get cake for his birthday. Since His Lordship isn’t much for baking, unless we go out to dinner somewhere with a creditable pastry chef, I don’t get one on my birthday either. The fact of the matter is that Chez Disdain is a birthday cake-free zone. That is a chocolate souffle, and it’s part of a long-standing tradition which began with his deciding to surprise me back when we were in grad school. Being no fool, I’ve insisted on repeat performances every year since. At this point I can’t imagine celebrating my birthday any other way. But. As much as I adore the souffles and would never give them up, every few years, I kind of miss cake. Since this year’s birthday not only fell on a weekday but the one on which His Lordship would be out all evening at an orchestra rehearsal, I decided to use the time alone to make my own damn cake. 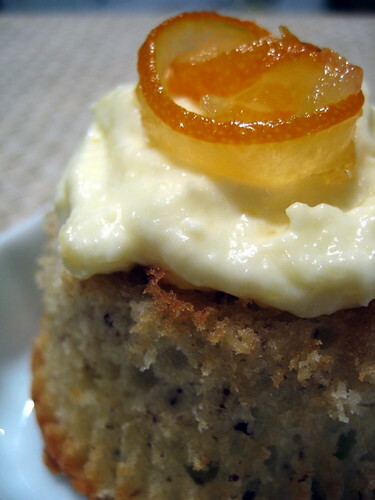 Specifically, almond cupcakes topped with a frosting of the quick Meyer lemon jam folded into creme fraiche. The cupcakes were a quick and painless mix job, came out beautifully tender and cloud-light, and provided a nice neutral base for the brightly lemony cream. 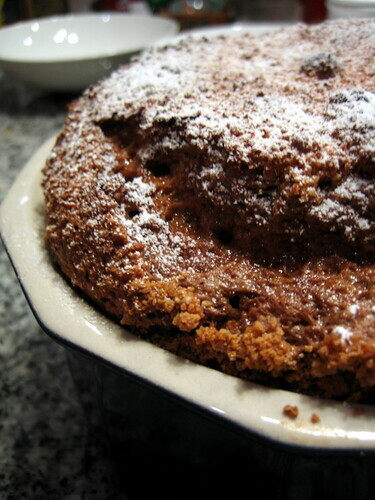 They would have had more almond flavor if I’d had almond extract and time to toast almonds instead of using pre-ground almond flour, but they were still quite birthday-worthy, and made me more than content enough to wait all the way to this weekend to get my souffle. Preheat the oven to 350 F and line a 12-cup muffin tin with paper liners. In a liquid measuring cup, combine the egg, 2 tablespoons sour cream, the Amaretto, and the vanilla. In the bowl of a mixer fitted with the paddle attachment, mix the flour, almonds, sugar, baking powder, baking soda, and salt on low speed briefly to blend. Add the butter and remaining sour cream and mix on low until the dry ingredients are moistened. Increase the speed to medium and beat for 90 seconds, then scrape down the sides. Add the egg mixture in three additions, blending for 20 seconds between additions and scraping down as needed. Using an ice cream scoop, divide the batter evenly between the twelve lined cups. Bake for approximately 20 minutes, until the tops are firm and golden and a tester comes out clean. While the cupcakes are baking, fold the jam into the creme fraiche until completely combined. Cover tightly and refrigerate until ready to use. 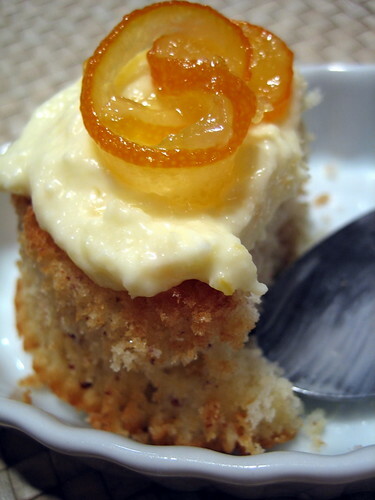 When the cupcakes have cooled sufficiently, top with the creme fraiche and, if desired, a twist of candied Meyer lemon. The lemon creme fraiche will still be pretty fluid when freshly made, and will firm up to a softly spreadable frosting if refrigerated for a few hours. You could serve the barely-cooled cupcake atop a pool of the sauce-like cream, or cool them completely and top them with the chilled cream. Your call. You can double the quantities for the cake and bake for 35-40 minutes in a buttered and floured 9-inch cake pan for a full-sized cake instead. We loves Meyerses. Yes, we do. We loves them so much that we sacrifice valuable checked-luggage space just so we can smuggle several pounds of them back from California, probably violating numerous state and federal agricultural regulations in the process. We piles the preciouses up on our kitchen island and stares at them for days, until they start showing signs of wrinkling, and then we panics and makes everything we can think of to save them from being wasted. Ahem. OK, enough first-person Gollum plural. I believe I’ve made my point, which is that one of the best parts of spending the holidays in California is bringing as many lemons as possible back. This year, thanks to the combined generosity of my brother, his fiance, and His Lordship’s parents, who made sure I was supplied with lemons despite having no opportunity to shop for them myself, I had enough to require last-minute rearranging of our luggage to avoid paying overweight baggage fees. And unlike my attitude toward persimmons, it physically pains me to let Meyer lemons go to waste, so pretty soon after our return to the East Coast, I had to make efforts to preserve them. 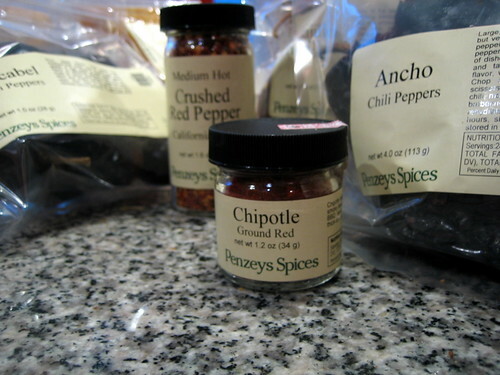 She most certainly did make the trek on a wretchedly rainy Saturday to the dangerously-nearer-than-before Penzey’s boutique, wherein she proceeded to plunk down more than $80 on spices. What? I just moved! I needed to restock! Not to mention, the holiday season is coming up! Don’t judge. By the way, was I exaggerating when I said I clean out their chile section whenever I go there? Yes, I do like it hot. QED. So anyway, you might be wondering what I did with this embarrassment of spices when I got home. Well, the first thing I did was make a curried egg salad sandwich for lunch. The second thing I did was to make these fantastic cupcakes for afternoon tea, because spotting the poppy seeds on the Penzey’s shelves reminded me that I’d been craving them for weeks. The cupcakes also gave me an opportunity to crack open the little jar of dried orange peel and intoxicating Mexican vanilla extract, both of which are absolute necessities for my holiday baking. While these were cooling, we took the Monster out for her walk, and of course the heavens chose that precise moment to crank up the rainfall to 11. Normally that would put me in a vile temper, but I came home to ferociously strong and milky tea, snappy little cakes, a pantry full of future deliciousness, and an excuse to trot out the totally awesome poppy pin I got at the Museum of Opium in Thailand. I have absolutely nothing to complain about. 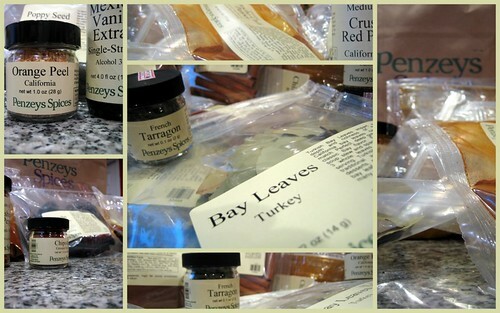 Except perhaps the project this shopping spree spun off, namely finding a storage solution for my spicy bounty. On our way out of the store, His Lordship declared the current arrangement — a big covered bin into which all the zip bags and little jars are unceremoniously tossed — unacceptable. If anyone has any suggestions that do not involve me wasting hours transferring spices into little jars I don’t even have the shelf space for, I’m all ears. Preheat the oven to 350, and line the appropriate number of jumbo or regular muffin tins with foil or paper liners. 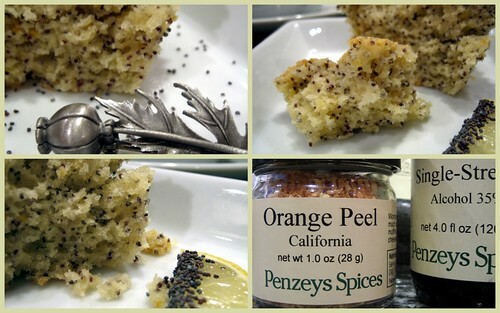 In a small bowl, whisk together the flour, baking powder, salt, and poppy seeds. In a large bowl, beat the eggs with the sugar and zests until pale and light. Whisk in the liquid mixture, then fold in the dry ingredients until just incorporated. Scoop the batter into the muffin cups, filling no more than halfway. Bake 20-25 minutes for regular cupcakes or 25-30 for jumbo cupcakes, until golden and springy and the proverbial skewer comes out clean when inserted in the middle of a cupcake. Cool the cupcakes in their tins on a wire rack. If the cake recipe has a vaguely familiar ring, it’s because the endoskeleton is the same basic one that supports the olive oil cake I wrote up last month. Like Alton, I adore a multitasker, and this recipe is as adaptable, quick and foolproof as any you’ll ever find. I favor cupcakes not because I have a weakness for cute food, but because they cook faster than full-sized cakes, and leftover individual cakes are easier to share with coworkers or friends than a partially-eaten cake. If you have neither concern, bake the batter in a buttered and floured 9-inch round pan for 35-40 minutes. I am, as you might have guessed, not much of a moderate person. What I love, I love with consuming passion, and what I hate, I loathe. In the latter category is New Year’s Eve, concerning which I’ve made my views amply clear. And no, I haven’t changed my mind. There’s not enough sparkly alcoholic beverage in the universe to quiet my inner grinch on this or any other December 31st. Conversely, among the objects of an affection so unrestrained that any other day of the year they’ll put me in a near-narcotic state of bliss are rosemary, and Meyer lemons. Rosemary I adore so shamelessly that I’ll fondle any rosemary shrub that crosses my path, running my fingers along the aromatic spikes to perfume my hands. When they started marketing those tree-shaped topiaries, I thought I’d died and gone to heaven. If they made them big enough to use as actual Christmas trees, I would fork over however much money it would take to bring one home, and damn His Lordship’s anti-decorating bah humbuggery. As for Meyers, I still weep over the dwarf tree I had to leave behind with my father-in-law when we moved east, and my heart rejoiced at being briefly reunited with it on Christmas Day and receiving the two little fruits of this season. Loving, as I do, not wisely but too well, I bought an unadvisable quantity of both this past weekend at one of my very favorite places on earth: the San Francisco Ferry Terminal farmer’s market. I did manage to restrict myself to two very large bunches of fresh, organic rosemary, but you do not even want to know how much I blew on exotic citrus. Let’s just say that if it were Schedule II drugs, I’d be in very big trouble with the feds. So now I’m sitting on a stockpile of lemons and herbs and I’d better start doing something to use or preserve them before all that money and giddiness shrivel up and rot. I’ve previously paired these two mood-lifting ingredients in an improbable but delectable cookie form, but frankly, I’m cookied out at this point, and I suspect you might be too. Inspired by another market offering I found intriguing, I’ve decided to experiment with flavored salt instead. The original product I tried was a lavender salt, and although I quite like lavender, it is nothing like my idolatry of its tiny-blue-flowered cousin. I googled a few recipes for flavored salt, just to make sure I wasn’t going to risk botulism or anything, and then forged ahead with reckless abandon. I am already enchanted with the sunny yellow and green glimmer of it in its jars. I hope that, after a bit of a courtship period, the mature salt will capture and hold fast everything I love about the resinous, powerful punch of rosemary and the otherworldly fragrance of the lemons, and will remind me of home every time I sprinkle it on salad greens or simply-prepared vegetables or oil-drenched bread. While I was feeling industrious, I also made Meyer-scented sugar, rosemary-scented sugar, and two little jars of preserved lemons. If any or all of my other endeavors pan out, I’ll be sure to gloat report about it. Place the salt in the bowl of a food processor. Pull the leaves off the rosemary and zest the lemons, and add both to the salt. Pulse until the rosemary and zest have been minced finely but not pulverized. Transfer to clean jars with tight-fitting lids. Give jars away if you’re of a generous spirit, or hoard like a greedy dragon if you’re not. You could use regular lemons if you can’t find Meyers, but if you’d like to try the cheat I’ve used to try to evoke some of their magic, supplement the regular lemons with the zest of one or two mandarin oranges. Well, that didn’t take long. Despite my good intentions, despite the fact that it’s only been two months, and more importantly, despite my student budget, I bought another cookbook. Oh, I could protest that it was just a lucky find on the bargain table (always a bane to my willpower), that I’ll stop after just this one more, but we all know that’s classic junkie denial, don’t we? I’ll do it again. I won’t even feel guilty about it until we’re packing to move back, and then I’ll curse the weight and the extra shipping expense. Although hey, it’s not just a cookbook. It’s Sally Schneider’s cool treatise on how to improvise in the kitchen, in which she gives basic recipes and shows how she plays with variations to come up with new and creative dishes. This is already an approach I’ve been trying to take since making the decision a while ago to be less recipe-bound, but with its pretty pictures and enthusiastic narrative, this book is a great source of fresh inspiration. Riffing on her basic recipe for brown sugar butter cookies produced a sophisticated and pretty shortbread flavored with lemon and speckles of black tea. One of the suggested variations used Earl Gray tea, which I actually loathe despite my usual love of citrus in all forms. 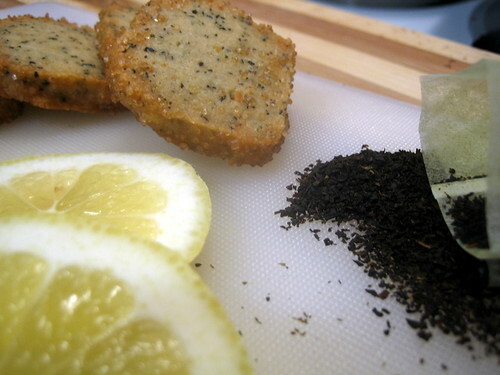 Since I liked the idea of fusing my tea and cookies, I put together my own lemony blend and made a few other changes. The new all-me shortbread has a great up-front citrus hit followed by a low note of smoky floral tea, wrapped in a buttery, crumbly matrix. They’re perfect for a rainy afternoon snack with more tea or, if you feel like mixing your metaphors, a cup of cocoa. I’ll definitely be trying this again, since I’m now tempted to try darjeeling and spices for a chai feel. In a stand mixer fitted with the paddle attachment, beat together the butter, sugars and salt until fluffy. 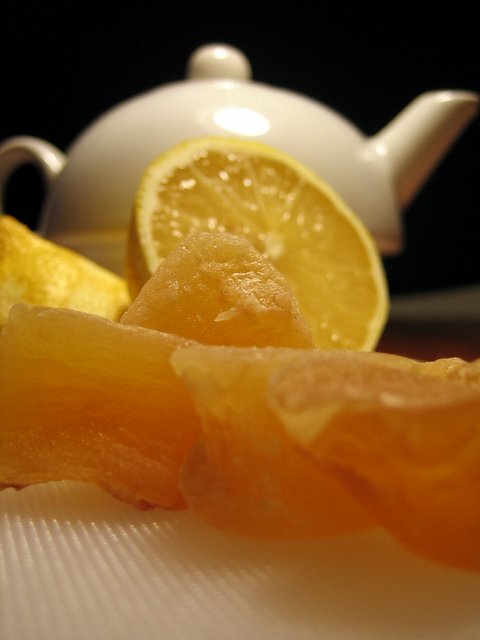 Beat in the vanilla, orange peel, lemon zest and tea. Whisk together the flour and cornstarch, and add to the sugar mixture in the mixer. Stir on low speed until just clumping into a ball, then dump out onto a sheet of parchment paper and shape into a long log 1 1/2 to 2 inches in diameter. Wrap the log tightly in the parchment and then in plastic wrap. Refrigerate until firm, at least 1 hour. Preheat oven to 325 F. Line baking sheets with additional parchment. Slice the log into 1/8 inch slices. Roll the edges in the raw sugar to coat, and set the slices on the baking sheets 1 1/2 inches apart. Bake until golden in the middle and just browning along the edges, approximately 18 minutes. Remove to a rack to cool. Like all shortbread, these will keep for days or even weeks in an airtight container, should you have the willpower to keep your hands off. These are two-bite cookies, just right to rest on a saucer. You could make the log fatter if you would like fewer but bigger cookies. Since I’m a citrus freak, next time I would increase the amount of lemon zest, but these are plenty lemony as is if you’re not as crazed as I am. I’m in the middle of the holiday cookie baking frenzy, having already made three kinds of cookies in the past week. One was an experimental batch to use the snowflake cookie cutters I bought in a holiday-induced bout of temporary insanity which made me forget that I have insufficient patience for cookie cutter cookies. The other two are going to be mailed out as holiday gifts, so I’m not going to post the recipe yet, so as not to spoil the surprise. In the meantime, there has been some demand for the recipe for the cookies I sent out last year, an almost laughably Californified but still addictively yummy shortbread that combined two wonderful flavors abundantly found in California gardens: rosemary, which grows like kudzu and is used as cheap ground cover, and Meyer lemons, which are intoxicatingly floral and aromatic, but often difficult and expensive to find if you don’t grow them yourself. Since I had to leave my beloved Meyer tree behind (along with my kaffir lime, which I miss nearly as much) when we switched coasts, I have to make do by mixing some orange zest in with ordinary lemon zest, which evokes some of the same magic and is far better than lemon zest alone. 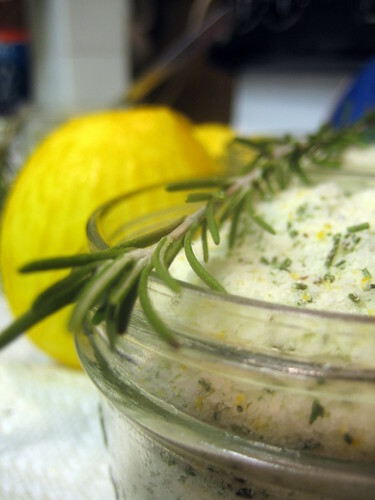 Cream together the butter, sugar, rosemary and zest in a mixer until very light and fluffy. Add the dry ingredients and mix until incorporated, taking care not to over-mix, which would make the cookies tough. Divide the dough into two equal blocks, wrap tightly in plastic wrap, and refrigerate until firm, at least 1-2 hours. On a lightly floured surface, roll out each block to a thickness of 1/4 inch. Cut the dough, using square or round fluted-edged cookie cutters approximately 2 inches across, and place the cookies on parchment-lined cookie sheets. Place the cookie sheets in the freezer or refrigerator briefly to firm and cool the dough again and avoid spreading in the oven. Bake in the center of the oven for 12-14 minutes, or until pale gold but not browned. Let the cookies cool on the sheets for 5 minutes, then transfer to a rack to cool completely. Notes: The amounts of rosemary and zest can be varied according to your tastes. I wouldn’t add much more of the rosemary, but you can decrease it at will, and you can also increase the amount of zest if you prefer even more lemony cookies. Also, you can gather the scraps after the first cutting and roll out another batch, although the quality will decrease a bit from the first. They will still taste lovely, but the texture won’t be quite as meltingly delicate.